Updated: now read our Nokia N8 review. Nokia has finally announced the UK release date of its forthcoming Nokia N8 handset, nearly six months after it was first announced. A 22 October UK release date has been given for customers wanting to pick up the new phone from networks and phone re-sellers, with Vodafone already updating its pre-order page. The phone looks likely to be offered from £30 per month through these high street channels, and will be available from Three, O2, Orange, T-Mobile and the aforementioned Vodafone, so no matter what network you're on there's a chance to get your hands on the new hardware. 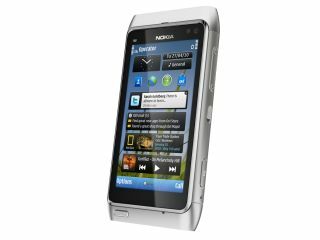 However, if you have a bit of cash to spare and want to get it a week earlier (on the 15 October) then that can be achieved through the Nokia web shop – but the N8 will set you back £429. We first brought you official news of the Nokia N8 back at the tail end of April, so it's been a long old road from announcement to launch, where Nokia has stated it won't release the N8 until it's fully ready. We published our in-depth hands on Nokia N8 review recently, where we weren't convinced this was the flagship handset we'd be desperate for, but we'll be bringing you our completed Nokia N8 review any day now, so you can see how it stacks up against the competition.